Prairiebreak: What's in a name? I notice that the Worldwide web is chockablock full of rhapsodies about this strange bulb and its color. A blend of chartreuse and icy blue that almost achieves gray (a rare and dubious color in flowers): it is luminous in the landscape and I am sure I am not the only one who wonders why we like it so much. 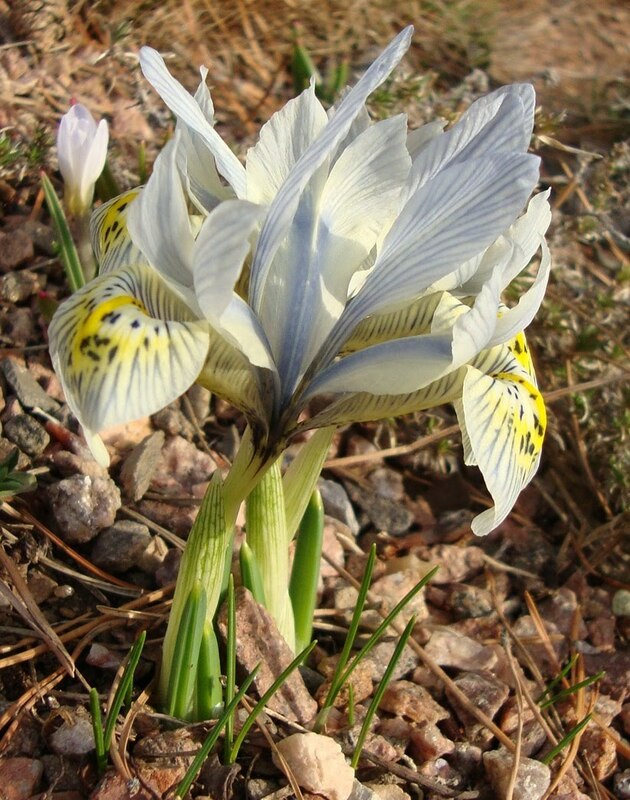 Of course, we love it because of its constitution: this is one reticulate iris that thrives on clay, in sand, in shade, in sun. Just about anywhere. It clumps up in just a few years, and is easily divided as soon as the flowers fade. I recall when it first came on the market many years ago: bulbs sold for what was then fabulous sums for me: double digits for a bulb struck me as ludicrous. When my friend and mentor Paul Maslin shelled out and bought one, I was impressed. I recall admiring it year after year as it waxed and grew, and wondering if I too should plump for a bulb, or buy dozens of cheaper (and still desirable) bulbs for the same price: ever the bargain hunter I went for quantity. Time has rewarded my patience. Nowadays every self respecting garden center has sheaves of plastic sleeves of 'Katharine Hodgkin' in the autumn selling for a fraction of the original price. Like computers, bulbs get cheaper and cheaper with time. But as much as I love her (and I do: Katharine is blooming all over my rock garden right now, and thick clumps are undoubtedly blooming everywhere at my old house I sold four years ago)--it is the weave of relationship that fascinates me early this morning as I type in this blog: just as Jim treasured his relationship with Eliot and Katharine, I treasure the times I spent with Jim and with Paul Maslin, the first undoubtedly to grow the Hodgkin namesake in Colorado. Then one day I as I was reading Bruce Chatwin's essays, I stumbled on the name again: Bruce rhapsodizes over the Hodgkin's son Howard's miniature paintings . (To extend the web of coincidence, there was also another Eliot Hodgkin, yet another great painter and writer to boot!) He too has passed away, like everyone else mentioned here. Even Hodgkin's lymphoma is named for a family member--quite the family: artists, medical researchers, gardeners! All of whom have left a legacy: what's in a name? A rose by any other name would smell as sweet, perhaps, but words preserve entire lives. I imagine Eliot calling Katharine out into his garden one early spring day in Dorset: "Come quickly, dear: that iris we hybridized all those years ago has just opened its first flower: isn't it amazing!" *"Katharine" outpaces "Katherine" on Google search when it comes to this little iris: but where is the truth? This name seems to retain the Elizabethan creativity when it comes to spelling...I have no doubt that Mrs. Hodgkin had strong opinions as to how her name should be spelled: can any one out there provide a definitive answer? Very nice essay! I was particularly caught by your phrase, "It is the weave of relationships...", as nearly every plant in my garden evokes some further association independent of the plant itself. In a way that is always the invisible part of a personal garden, the friends, family, trips and outings that we "see" when we look at our gardens. To others, it is a lovely collection of plants, to us, it is almost a kaleidoscope of our lives.